JANABAI KOHALE cannot remember a time when she did not have to climb down a well in summer to collect the last drops of water left in it. “There was a large well with steps all the way to the bottom, and every summer, women would climb down it and fill their pots by scooping up the little water at the bottom with a small vaati (bowl). It took at least half an hour to fill up one pot,” remembers the septuagenarian from Ghoguldara village in Maharashtra’s Yavatmal district. Two decades ago, the step well collapsed, and the government dug two new wells. The women had no option but to tie a rope around their waists and let themselves down the wells. “Sometimes, my daughter-in-law would have to go at night to fetch water. The government provided tankers, but they were unreliable,” says Janabai grimly. Under usual circumstances, this year, the situation in Ghoguldara should have been even worse than what Janabai describes. This year, Yavatmal received just 450 mm of rain, which is half the average rainfall for the district. Cotton production in the district is down to a dismal 325 kg per hectare, and no one is so much as thinking of sowing the rabi crop. Ghoguldara, however, appears to be an exception in this scene of despair. It has harvested 1,625 kg of cotton per hectare, and the rabi sowing, though delayed, is all done. The water level in the village’s two wells is three metres in December, when most wells start drying up even in a good rainfall year. This tiny impoverished village of Kolam and Gowaritribals, which used to be among the 4,376 villages to put in a request for water supply by tanker every year, has dropped out of the tanker list since 2013. The metamorphosis is the result of recent attempts by Ghoguldara residents to revive dohs­—deep pits that occurred naturally along the bed of a stream. 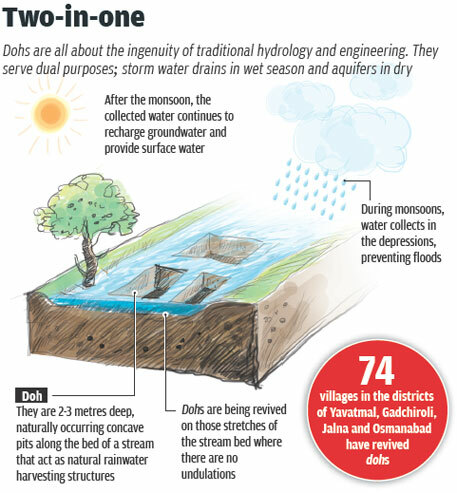 These dohs acted as natural rainwater harvesting structures, explains Madhukar Dhas of Dilasa. The non-profit is helping communities across the dry, rocky areas of Marathwada and western Vidarbha revive dohs. Dhas says people in these regions used to rely on dohs till a few decades ago. “Dohs have been around since the times of our grandparents,” says Sadobai Selar, an elderly matriarch from Dhangarwadi village in Yavatmal. It was a summer-time community space where people would bathe, wash and take animals for a drink. Most of them had designated uses—some for bathing and washing, others for animals, she adds. With modernisation, dohs have rapidly disappeared from all over Vidarbha. The prime reason was deforestation which led to heavy siltation. The result was a frustrating flood-drought cycle. Since expensive construction material like iron or cement is not used, the model is not only environment friendly, but also gets completed in a shorter time. But the biggest advantage of doh revival is that the rate of siltation is extremely low. “Most check dams silt over in four years at the most. But natural dohs have been around for centuries without silting. The lighter silt material is borne away because of the constant flow of water, while the heavier material sinks, forming a sand layer which is much more porous than silt and hence does not choke the stream bed,” says Khorasi. The change that the dohrevival has brought has to be seen to be believed. In Dhangarwadi, where work started in 2006, dohs have been dug along three streams with a total length of 1,500 metres, for harvesting 30 million litres of water annually. Cultivated land area in the village has gone up from 30 hectares to 136 hectares. The village’s agricultural income has risen from Rs 4 lakh to Rs 1 crore annually. “And all this for a total expenditure of just Rs 33 lakh over five years,” says Dhas. Migration has also dropped to zero in this village of sheep farmers. 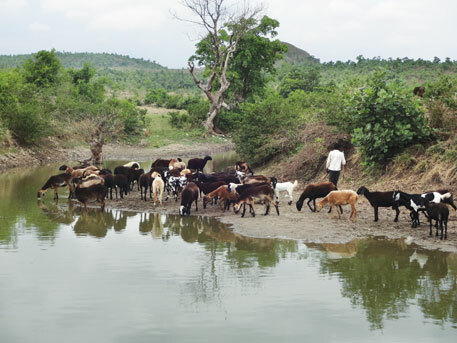 “We now have enough fodder and water all year round for our sheep,” says sarpanch Krishna Ahire. In Ghoguldara, the village handpump, which used to dry up in December, is still running smoothly this year. “Fetching water was a nightmare earlier. Now, we have much more time for other work,” says resident PanchafulaKohale. Farmers now are growing two crops. “People are crying for water in other villages. And I made Rs 15,000 by selling vegetables ins summer,” says farmer Santosh Dhoke. Indeed a very timely and informative reporting. However, these water harvesting protocols need to be put into the institutional memory as well as into the sop of the watershed programmes. But the biggest barriers will be erected by the very visible hands of the babudom. The way out is to make the local body, Panchayats, more viable and strong. It is good to see rain water harvesting in natural way. one of concern is the doh is 2-3 meter deep, if someone falls in the doh, then what is the safety measure?